Achtuning was invited to open up their shop on the grassy fields of Mountain Meadows Farm at the base of Mount Si, the venue for the second annual WaterWerks On The Green event. With our freshly installed (literally the night before) StopTech big brake kit on our VW CC we joined the Achtuning line-up on display. We were graced with the presence of a black-on-black, APR “Stage 3” tuned (supercharged) Audi RS4 producing about 538 horsepower and 475 ft-lbs. of torque and equipped with StopTech’s Trophy big brakes both front and rear. The RS4 and our CC flanked the APR Stage 2+ Achtuning Audi A3, which by the way is still in need of a good home! 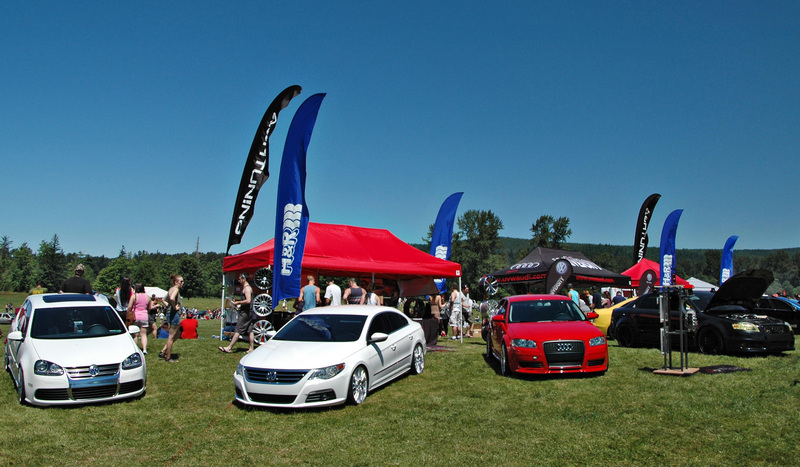 Joining Achtuning with their displays were H&R and University Volkswagen who brought out a new Audi S4 and a 2013 Volkswagen Jetta Sportwagen TDI. The JSW was outfitted with H&R coil-overs and a factory Votex kit only nights before the show while they debuted Achtuning’s latest wheel, the Hartmann HLP-410s. … At least we were still able to get our obligatory “Mount Si background” shot of the CC, H&R flag and all! :D We’re looking forward to seeing what the 2014 event will bring, minus those damned deer flies! The Mt. Si shot with the CC….. Wow, so beautiful! Congrats on the big brake kit. How are you liking it so far? Aside from the “flappy paddle” steering wheel, by far the best upgrade yet!